Weight indicator with 8 inches touch screen display. New IP68 housing with adjustable viewing angle brackets. Integrated LED control light on the front panel and Integrated Ethernet port as standard. The 3590EGT8 indicator, in addition to the standard weighing programs that are available also has a development environment for specific applications with an integrated debugger and programming tools for the PC. Thanks to the completely customizable screen layouts it can display all the weighing data, database records and free texts, this considerably simplifies the user operations. CEM approvable (OIML R76/EN 45501). 8 inches (160x120mm) resistive backlit color touch screen graphic display. Suitable for use with gloves. Stainless steel case with adjustable inclination and IP68protection. Multilingual software, available in: Italian, English, German, French and Spanish. It is also possible to enter our own translation, thanks to the new software “CUSTOM LANGUAGE TOOL”, downloadable from the DOWNLOAD section of this page. 3 colour high brightness LED control light. Available touch screen keyboards: QWERTY, AZERTY or QWERTZ. As standard fitted with an adjustable bracket, for bench or wall mounting. Real time clock and permanent data storage. Supplied with alibi memory, integrated on the motherboard. Slot for internal micro SD (optional) to store logos. Functions available with DINITOOLS Utility Software, even from remote (WEBSERVER mode via internet). - Configuration, data entry and print formatting. - Transmission and storage of all the information on PC. - Complete backup of the configuration. - Instrument calibration with numeric values (theoretical calibration). - Customization of the layouts. - Development environment for custom programs through specific programming language. 24bit A/D converter, 4 channels, up to 3200 conv./sec. with autoselect and up to 8 signal linearization points. 4 independent analogue channels (up to 2 in the EAF03 version). Connectable with up to 16 analogue load cells of 350 Ohm (45 load cells of 1000 Ohm) and with the main digital load cells available on the market (in the EAF03 version). Up to 10.000e OIML or 3 x 3000e @ 0,3 μV/d in approved version CEM. Up to 1.000.000 displayable divisions for internal factory use, with internal resolution up to 3.000.000 points. 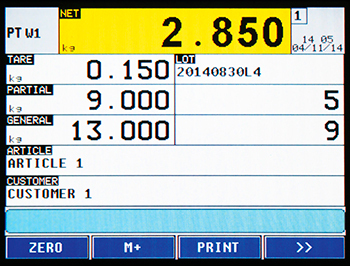 Connectable to printers and labellers with free programming of the printout formats. 110-240 Vac power supply or external rechargeable battery pack (optional). Motherboard with removable screw terminals. 1 internal Ethernet port as standard, to connect to the company network. 1 RS232 serial port on RJ45 connector (if activated, it deactivates the Ethernet port) for connection to printer, PC, PLC, radio module and optional interfaces. 1 RS232 serial port on screw terminals for connection to printer, PC, radio module and optional interfaces. 1 RS232/RS485 serial port on screw terminals, for connection to weight repeater, remote scale, badge reader or digital load cells. Fitted keyboard emulation input, for barcode/badge readers or external PC keyboard, through cable with mini DIN connector (optional). 4 optoisolated outputs, expandable up to 16 with optional board. 2 optoisolated inputs, expandable up to 8 with optional board. External Profibus interface (optional), for automation management. Optional Bluetooth connection, for quick wireless programming of databases, through PC, smartphone or tablet. Analog output DAC16O needs the expansion board IOEXPB and it's only compatible with the bench mounting. 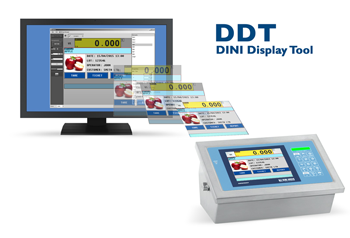 The PC software “Dini Display Tool” allows the quick customization of the TOUCH display. - Serial port management, protocols customization. - Sequential or simultaneous automations. - Data entry, custom archives. Vetek can offer the service of custom development programs. You can ask for a quotation. Alphanumeric radio repeater with 110 mm multicolour LED display. Column for DINI indicators. Stainelss steel (Base painted steel). PC software for the quick compiling of the databases. RS485 to ProfiNET interface, for DIN rail mounting. RS485/Profibus converter in a slim case, ideal for mounting on Omega/Din bar. WiFi compact converter to be mounted in weighing instruments.